Every website has a purpose and yours is no different. Setting up and tracking site goals is the best way to make sure your site is successfully delivering what your users need. Arc tracks and shares those goals in Slack so you can be sure your site is living up to its purpose. Now you can focus on hitting your goals instead of visiting Google Analytics every morning and digging through extra menus, reports and graphs. 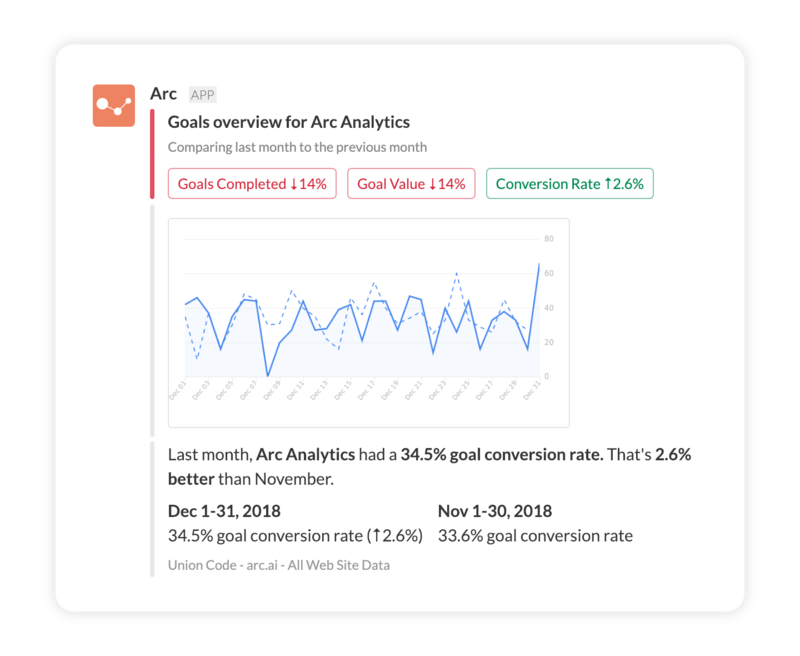 Arc delivers your completed goals, value of those goals, and your goal conversion rate with clear numbers and simple charts so you and your team can see performance and trends. If things are trending well, your site is effectively giving your users what they need. If things aren’t looking up, you’ll need to look into the details to understand what’s missing. To set up a Goals Overview summary, log in to Arc and either add a new or edit an existing summary. Once you’ve got your Google Analytics account and Slack channel set up you can choose Goals Overview from the Shown as drop down. You should now see a preview of the new Goals Overview summary! So that’s how Arc provides a clear view into your site goals! Another small change with a big impact 👊.